In search of perfection – Heaney offers his version of an 18th century Irish list of ‘instructions’ given by an agricultural labourer to his ‘spade-maker’ in the confidence that the latter can engineer the bespoke tool he requires to become a champion at what he does: a side-arm to take on the earth. The spade must meet the following criteria: fit-for-purpose (suitable for digging and grubbing), comfortable in his grip (right for the hand); when taking a break (pleasant to lean on); aesthetically pleasing (tastily finished); of flawless appearance (no trace of the hammer); with the necessary elastic qualities of purchase and spring that save it from snapping; perfectly engineered where wood meets metal: The shaft to be socketed in dead true and dead straight. To possess the perfect tool is worthy of a pledge: work with the gang till I drop and never complain. The business end to possess no imperfection (wrinkly or crooked) in the blade especially its leading edge that must be well shaped from the anvil and sharp from the file; only the best quality wood to be properly fitted to the shaft, grain and line in harmony (nicely fitted). The final measure of almost spiritual perfection will only emerge when the blade hits the soil: best thing of all, the ring of it, sweet as a bell. The metaphor fits the process of writing neatly. Heaney’s work constantly offers insights into writing poetry and poetic aspiration – perfection is possible and that the criteria can be set out. 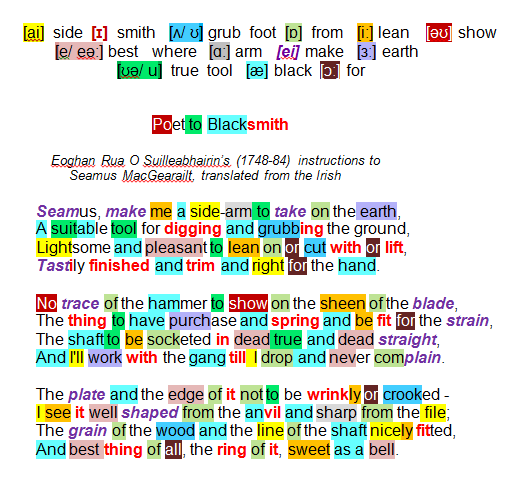 Of course the poet is required to act as his own blacksmith!